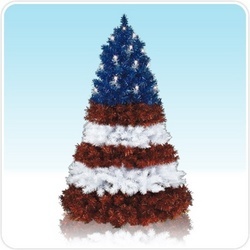 In honor of this exciting election year, Treetopia held an election to name its patriotic, US flag-inspired artificial Christmas tree, allowing visitors to vote on their favorite name for the tree. Visitors could choose between the Stephen J. Colbert National Treasure Tree, the Hockey Mom Palintology Tree, and the Change, Change, Change Obamamania Tree. With the results of the national election old news, Treetopia.com has announced the much-anticipated winner of its Vote for Me tree election. The tree will now officially be named the Stephen J. Colbert National Treasure Tree after revered TV pundit Stephen T. Colbert. 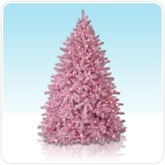 In honor of this exciting election year, the website held an election to name its patriotic, US flag-inspired artificial Christmas tree, allowing visitors to vote on their favorite name for the tree. Visitors could choose between the Stephen J. Colbert National Treasure Tree, the Hockey Mom Palintology Tree, and the Change, Change, Change Obamamania Tree. The Stephen J. Colbert National Treasure Tree received 43.2% of the votes, easily winning the election. The Barack Obama inspired name took second place with 30.7% of the vote, while the Sarah Palin inspired name trailed close behind at 26.1%. The Stephen Colbert tree pulled ahead of the others in early voting and continued to hold its lead throughout the election period. He appears to have bi-partisan support with a strong showing in both red states and blue states, as well as some Canadian provinces and Mexican states. While Stephen Colbert's bid for the United States Presidency was thwarted in the South Carolina primary, he can claim victory in one important election this year. 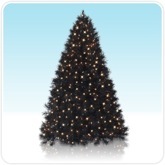 Stephen Colbert can now add the Treetopia.com patriotic Christmas tree to his list of things that are named in his honor. A brightly colored tinsel tree that rotates surely belongs on a list that includes a species of California spider, a junior hockey team's mascot, and a Ben & Jerry's ice cream flavor.